Which makes for the more frightening or unsettling ghost story? Is it one set in an enclosed space, like a haunted house or old church, or one whose horror come from the outside world? The simple answer is that either one can in certain circumstances be equally as horrific. Perhaps the thing in the dark crypt is the more scary, or even just the threat of it. In Stephen King Danse Macabre, he describes the fear of the monster in the cupboard as being far worse to an impressionable child than the reality of the monster itself, which could just as easily turn out to be another Wizard of Oz. But of course horror may not be just confined to some cliched haunted house, or similar enclosed space, as you will no doubt know if you've ever been lost on your own in a dark wood on an even blacker night. But,some may say, surely a crypt or catacomb or graveyard is the more terrifying if the light suddenly goes out. Anyone who's ever been in a cave system when the guide plunges it into its natural darkness, knows that all too well. Darkness, whether we are deprived of it within or without is equally terrifying. Let’s try them out both inner and outer experiences one at a time, beginning with the inner. Let’s say you are the vicar of a particular parish. You are in your church late at night, one of those rare times when every experience seems designed to be enhanced so that if can provide you with the maximum Hammer horror scare factor. This may involve something as innocent as accidentally knocking a hymn book to the floor with a stray elbow, or the organ suddenly starting up when you had no idea Mr Jessop had changed his night, or a particularly violent wind suddenly slamming the door shut. All well and so-so, but if you wanted to really scare someone, if you were a writer say, you might add a little spice to the ancient church at night mix. Perhaps a scuffling sound which might or might not be rats, or a low moan which surely must be caused by something other than the wind. You might have some particularly ghoulish misericords which light up under a flash of lighting, or a chair or plinth which seems to have moved. There may be a mysterious and possibly evil book open on the altar, which certainly wasn't there when you left it. And your reverend might, just might, have his own guilty secret, which the happenings which are about to enfold will shortly bear witness to. I’ve just described some of the ingredients of the classic English ghost story, the sort that might have been employed by the man who is quite rightly acknowledged to be the greatest of all English ghost stories, Montague Rhodes James, known more familiarly as M.R. James, or Monty to his friends. But it's time to expand our horizons. You are taking a lengthy unhurried boating trip down the Danube. Having left the city of Vienna a few days ago you are now travelling through the small villages beyond the Hungarian border. With a storm in the offing, you and your companion, a rather taciturn but thoroughly dependable Swede, (who has little truck with superstition), decides that it might be best to pitch your tent on what looks at best to be a temporary island in the river, intending to continue your trip the next day when the storm is past. As night falls you find yourselves trapped in this gloomy and ominous space, where great willow bushes seem to hold far more dominion than they should do. Rather than just a series of ideas, this is the actual plot of a short story called The Willows. It is recognised as a classic of the genre, but in contrast to the much lauded MR James, the author has been sidelined in the shadow of James. 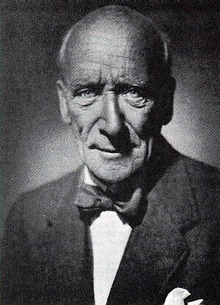 Like James,Algernon Blackwood was born in Kent, seven years after James, in 1869, and like James, (whose father was an Evangelical Anglican clergyman) came from a strict religious upbringing, but managed to break away from it at the age of twenty and travel to Canada. In contrast to James, whose travels were more adventurous in his youth, Blackwood travelled widely, having many and various jobs and adventures. He spent much of the rest of his life time studying Eastern mysticism. This is what gives his tales such a varied palette of story colours to draw on, ensuring that even in his slighter fiction there is almost always something to enthuse about. Algernon Blackwood was a master of mood and atmosphere, but unlike, James, his experiences and his open-minded nature, forever in search of new and often arcane knowledge, enabled him to write his experiences into full length novels, chap books and essays, as well as the huge amount of short stories he became famous for. In contrast to the small collection which comprises the three volumes of James Ghost Stories of an Antiquary, Blackwood wrote many hundreds, and yes there are plenty of ghost stories in his many collections like The Empty House, but the idea of a ghost story writer barely suits him in the same way that it seems the perfect fit for James. Perhaps his stories are best described in the title of a volume of forty, Tales of Terror and Darkness, which I had on my shelves as as a teenager and wish that I still did. MR James was clearly a master of mood, atmosphere, suspense and as the jacket of the collection I have of Ghost Stories of an Antiquity rather appropriately states, ‘haunting horror’. That certainly describes the experience of reading an MR James story like The Stalls of Barchester Cathedral or Rats in the Walls, but it might equally appeal, perhaps to Algernon Blackwood. But whereas a great deal of Algernon Blackwood’s haunting horror comes from his free ranging knowledge of religions, cults and ancient beliefs, those of M.R. James almost all come from and in a deeply Christian setting and as ‘Monty’ enthusiast Mark Gatiss illustrated quite excellently in his 2013 documentary on James, a great deal of his dark inspirations must surely have come from the many hours he spent in libraries, embedded in his particular fascination for lavishly detailed martyrdoms and the lovingly designed tortures of hell. Reading both writers it feels to me that Blackwood's writings are like expanded versions of the niche James mined so successfully and which brought him such fame. I use the estimable James and his reinvention of the ghost story as merely a side plate, so to speak for the main dish. For the subject of this blog is Blackwood, rather than James, and I am using an acknowledged master and his reinvention of a new type of ghost story, (what had formerly been all Gothic now had a new title - Antiquarian) as a way of exploring his lesser known contemporary. Once you’ve spent some time in either company however, you can be forgiven for wondering just why one is so lauded and the other ignored. It can’t just be that James was also Provost of King's College, Cambridge and a renowned medievalist, or that Algernon Blackwood had a more venturesome spirit. While one lived a life of quiet respect in the hallowed halls of King's', where the social highlight was to read his eager students his latest ghost story on Christmas Eve, (the late Christopher Lee recalled how he was one of this fortunate number), James Christian beliefs were ever in the foreground. 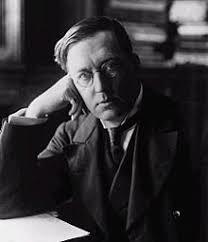 Blackwood's more adventurous beliefs and explorations in contrast led him in an entirely opposite direction, becoming a member of the leading British magical society. The Hermetic Order of the Golden Dawn, in the company of both WB Yeats and Arthur Machen. At this point I will allow Montague Rhodes James to take his departure, fully deserving as he was the title of one of the greatest of all ghost story writers, rather than the dubious honour of being compared with another. We can leave Monty in the 'relative' safely of that fusty old niche into which we have slotted him, where brooding atmosphere, old and troubled buildings and rooms, lost antiquities and their dubious provenances and codicils will always form the building blocks of the classic English ghost story, where thirteen is always an unlucky number, even doll's houses are haunted, cat demons haunt lowly churches and the there may be spirit of a witch in your ash tree! Quite likely he would prefer to be left there, having little wish to explore much any world beyond churches and libraries. I do however urge you to read him for any of the reasons above and a great many more. And his short and shocking There Was A Man Dwelt By A Churchyard remains the scariest story I have ever read. 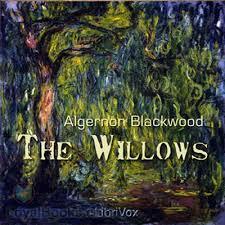 Instead let's dive into the dark woods, shuttered towns and abandoned settlements of Algernon Blackwood. Let's hear nothing but the cry of the loon on the still black river, and watch the dark silhouette of a dead native American in his canoe making his slow and deadly progress across the haunted lake, while the traveller who really shouldn't have stayed on after his friends had left, awaits his particular destiny. Or perhaps in New York we are hearing the same unsettling noises night after night and the particularly disgusting odour that comes from the small shuttered room in the attic. Or, closer to home, we might sit in a New Forest conservatory with poor Mrs Bittacy after her husband has finally been taken by the trees which have been encroaching further and further on the house. But be assured, even though the canoe comes closer, its occupant will merely pass through the modern world as insubstantially as a shadow, whatever horrors he may drag in his wake. Having found out from a friend the true nature of the tenant of the shuttered room, the reporter will move somewhere else very quickly. And - as Mrs Bittacy knows only too well- her husband was long ago taken by the trees he loves, and who love him equally, and has now gone quite willingly to join them and there is nothing her Christian beliefs can do to prevent it. In case you find the Bittacy's of The Man Who The Trees Loved a little too middle-class, then there are plenty of impoverished garret living heroes: cub reporters and lowly clerks and secretaries whose bosses offer little in remuneration until they prove themselves. Just occasionally however, a seemingly innocent invitation to have some simple paperwork signed by the firm's senior partner, can lead to all kinds of horrors, such as in the story of The Strange Adventures of a Private Secretary in New York. Here the unfortunate protagonist is forced to stay overnight at the senior partner's, only to discover that his host is a barely disguised flesh eating monster, and the cadaverous butler little better. Of course the best way to illustrate the themes which suffuse Algernon Blackwood's writing is to read them. This section is from Ancient Sorceries one of the stories involving one of his most famous creations, psychic investigator Doctor John Silence stories, Ancient Sorceries. “For the whole town, I suddenly realised, was something other than I so far saw it. The real activities and interests of the people were elsewhere and otherwise than appeared. Their true lives lay somewhere out of sight behind the scenes. Their busyness was but the outward semblance that masked their actual purposes. They bought and sold, and ate and drank, and walked about the streets, yet all the while the main stream of their existence lay somewhere beyond my ken, underground, in secret places. In the shops and at the stalls they did not care whether I purchased their articles or not; at the inn, they were indifferent to my staying or going; their life lay remote from my own, springing from hidden, mysterious sources, coursing out of sight, unknown. It was all a great elaborate pretence, assumed possibly for my benefit, or possibly for purposes of their own. But the main current of their energies ran elsewhere. I almost felt as an unwelcome foreign substance might be expected to feel when it has found its way into the human system and the whole body organises itself to eject it or to absorb it. The town was doing this very thing to me. “This bizarre notion presented itself forcibly to my mind as I walked home to the inn, and I began busily to wonder wherein the true life of this town could lie and what were the actual interests and activities of its hidden life. Here the narrator, Mr Vezin is giving Silence a lengthy description of the decidedly odd sequence of events which befell him when he decided to break his journey in a walled French town. It turns out that the whole of the population are descended from remnants of an ancient witch cult of devil worshippers, who also take the form of cat like creatures. Of course the rather tedious John Silence eventually reduces Vezin's experience to little more than a dream of shared ancestry, (Silence in this case being more a vehicle for a spooky story than having any active part), but we, the reader, know differently. Describing such a plot is can sound almost laughable, but Blackwood is a good enough writer to make it wholly convincing and remarkably eerie. All the ingredients of a tale of haunting horror are there: the lone traveller, the almost beast like landlady and her beautiful daughter, a shocking ancient legacy, and of course cats, whose somewhat alien feeling will always bring a certain atmosphere in its wake. Ancient Sorceries is a long tale, but a fine one which enfolds like an uncertain picnic, until you realise that everything you're eating is having a steadily hallucinogenic effect, taking you outside time and logic to a place which makes its own rules. I can't remember where I got my teenage copy of Tales of Terror and Darkness, but I do remember having it until fairly recently before finally discarding it. Some of Algernon Blackwoods stories are probably a little long and rambling for teenagers, but there's a reason why his stories used to sit side by side with James and Bloch, Lovecraft and Sheridan le Fanu in The Pan Book of Horror series of anthologies where I first encountered There Was A Man Dwelt By A Churchyard. It's because they're scary and often downright shocking. If you don't believe me, try The Insanity of Jones, part of The Listener and Other Stories. But if the plot of something like Ancient Sorceries tells us about Algernon Blackwood's interest in closed off communities and ancient legacies, it is merely part of a richer dish best described in a recognised classic tale like The Willows. But my emotion, so far as I could understand it, seemed to attach itself more particularly to the willow bushes, to these acres and acres of willows, crowding, so thickly growing there, swarming everywhere the eye could reach, pressing upon the river as though to suffocate it, standing in dense array mile after mile beneath the sky, watching, waiting, listening. And, apart quite from the elements, the willows connected themselves subtly with my malaise, attacking the mind insidiously somehow by reason of their vast numbers, and contriving in some way or other to represent to the imagination a new and mighty power, a power, moreover, not altogether friendly to us. This, particularly the notion of unfriendly powers, is typical of Blackwood's writing and ideas and possibly never more so than here in The Willows, where two travellers off the beaten track and forced to spend the night on this river island, discover that here the rules that they have always relied on simply do not apply, coming in fact from a source so ancient that it precedes anything we might recognise as either law or humanity. If there is a more claustrophobic tale than The Willows, I'd like to read it. If the feeling of ancient legacy and closed cult in Ancient Sorceries is one example and the primal horror of the unforgiving gods in The Willows another, then perhaps the theme which embodies Algernon Blackwood's work more than any other is the idea of his characters taking a brief glimpse behind the veil. The idea in science fiction films like The Matrix that life as we know it is all one giant manufactured conceit to deceive us, has actually recently become more and more likely due to the discoveries of quantum theory, which have far more in common with so called pagan and new age beliefs than they do with many of the ideas of traditional science. Perhaps we will never truly either know or understand what lies behind the veil, any more than we know about the mysteries of death. If you want to read one of Blackwood's stories on the latter subject then his beautiful and moving tale The Wood of the Dead, (also like The Willows to be found on youtube,) is a good place to start. In the meantime let's peek behind that vein in the company of yet another weary traveller in the tale of May Day Eve, one of a cynical and disbelieving bent who is on the way to see his friend the folklorist. He carries a brown wrapped parcel, which he says, will successfully debunk all of his friend's nonsense unscientific theories, Taking the long route there, he finds himself quite literally 'pixie led', when he take shelter in a long abandoned cottage. Inside he found not the old cottager he expects, but something which will change his entire beliefs and way of life. To the end I never saw what produced the light, nor understood how so many men and women found space to move comfortably to and fro, and pass each other as they did, within the confines of those four walls. An uncomfortable sense of having intruded upon some private gathering was, I think, my first emotion; though how the poverty-stricken countryside could have produced such an assemblage puzzled me beyond belief. And my second emotion—if there was any division at all in the wave of wonder that fairly drenched me—was feeling a sort of glory in the presence of such an atmosphere of splendid and vital youth. Everything vibrated, quivered, shook about me, and I almost felt myself as an aged and decrepit man by comparison. I know my heart gave a great fiery leap as I saw them, for the faces that met me were fine, vigorous, and comely, while burning everywhere through their ripe maturity shone the ardours of youth and a kind of deathless enthusiasm. Old, yet eternally young they were, as rivers and mountains count their years by thousands, yet remain ever youthful; and the first effect of all those pairs of eyes lifted to meet my own was to send a whirlwind of unknown thrills about my heart and make me catch my breath with mingled terror and delight. A fear of death, and at the same time a sensation of touching something vast and eternal that could never die, surged through me. 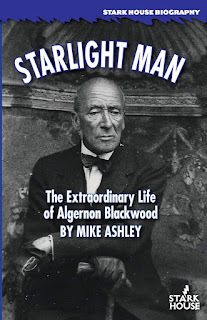 So if you've a fancy to take a journey to many strange and sometimes deadly lands with an experienced old guide as your ferry man, then seek out the extensive tales and novels of Algernon Blackwood. And when you've done that compare the wikipedia entries on both Blackwood and M.R. James. For the latter you'll see an astonishing array of testimonials in the form of novels, and short stories, TV treatments and a vast array of radio adaptations. Look under Blackwood's name and you'll find hardly anything. He's clearly long overdue for a reappraisal. if you're not already a fan, give him a try and you won't regret it. The same of course can be equally said for M.R. James. I remember reading Algernon Blackwood as a teenager, though I don't now remember any of the individual stories. I found him absolutely terrifying - even though I carried on reading them at the time, I'm not sure I'm brave enough to go back there now! Snapped up that kindle book - thanks for the tip, Steve! Blackwood's 'The Kit Bag' for instance, is one of the scariest stories I've ever read -- the equal of anything by James and I'm one of James' biggest fans. Do you -- or anyone-- happen to know who wrote a favourite story of mine which I can't find? I think the writer was a woman, but I can't remember her name. I think the story was called 'Harry' but I can't be sure. It's about a mother whose small daughter starts talking about an imaginary friend. At first the mother isn't worried, but as time goes on the child describes the friend as 'a big boy' who says he is her brother. She describes him as having red hair. Now the mother is alarmed because she lost her older son, who had red hair and was called by the name the child gives her friend. The boy was devoted to his small sister and when there was a fire in their flat, jumped from a window with her in his arms. He was killed, she survived. When the child starts saying that her brother has promised to take her away, the mother panics, though still trying to persuade herself that the child is fantasising around things she's overheard. I think she consults a doctor or a priest and this makes her late to pick her daughter up from school. The teacher greets her with, "Oh, you just missed them -- her brother picked her up and off they went hand in hand. What lovely red hair he has!" I think the story ends with the mother running down the road, looking for her daughter.